Those you who attended the LLOPS business meeting and birthday party last week got to try your hands at the LLOPS Trivia quiz put together by Barbara Swatt Engstrom and the program committee. For those of you who missed it, below are a few of the facts relating to the founding of LLOPS. 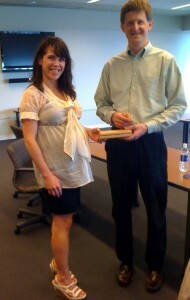 And what would a celebration of our chapter be without the traditional passing of the gavel, from Robyn to Mort. Here’s to a wonderful year behind us and looking forward to another wonderful year ahead. Who won the trivia contest?